so let’s get right into it as you may already know the pumping action of the heart is controlled by the heart’s electrical system the heart contains specialized cells they’re able to create their own electrical impulses and send them to a cardiac muscle causing it to contract now the cardiac conduction system is made up of five elements number one the sinoatrial node SA node for short number two the atrioventricular node AV node for short number three the bundle of his number four the bundle branches and number five the Purkinje fibers so the normal heart rhythm begins when electrical signals are sent from the SA node the signal from the SA node causes the atria to contract pushing blood through the open valves into the ventricles on the typical electrocardiogram this is represented by the P wave next electric signal arrives at the AV node and is briefly delayed so that the contracting atria have enough time to pump all the blood into the ventricles this is represented by the line between the P and the Q wave at this point this signal travels to the bundle of his into the bundle branches this is represented by the Q wave and finally this signal travels through the Purkinje fibers which causes the ventricles to contract and thus pump blood from the right ventricle into the lungs and from the left ventricle into the rest of the body. This is represented by the R and s wave the last D wave represents the recovery of the ventricles now cardiac cells can be divided into two types first contractile cells which make up most of the walls of the H and ventricles and when stimulated they generate force for contraction of the heart and the second type conducting cells which initiate the electrical in that controls those contractions now while contractile fibers can generate an action potential on their own that conducting fibers are capable of spontaneously initiating an action potential by themselves they exhibit so-called automaticity the conducting cells are primarily concentrated in the tissues of the SA node AV node bundle of His and Purkinje fibers now normally SA node reaches threshold potential the fastest which is why it serves as the natural pacemaker of the heart when the SA node drives the heart rate the cells of AV node bundle of His and Purkinje fibers do not express automaticity or in other words their spontaneous depolarization is suppressed however under certain conditions when activity of the SA node becomes suppressed or the firing rate of these older conducting tissues becomes faster one of them can become the new pacemaker of the heart this is why the AV node bundle of His and Purkinje fibers are called latent pacemakers now before we move on let’s take a closer look at the action potential of the pacemaker cells versus the heart muscle cells as there are some important differences between them so in the heart each cardiac cell contains and is surrounded by electrolyte fluids. The main ions responsible for the electrical activity within the heart are sodium calcium and potassium when cardiac cells are stimulated by an electrical impulse their memories permeability change and ions move across the membrane thus generating an action potential so now the membrane potential in the pacemaker cells starts at about negative 60 millivolt when spontaneous flow of sodium mainly through slow sodium channels and opening of the voltage-gated t-type calcium channels continue slow depolarization this is referred to as phase four once threshold potential of about negative 40 millivolt is reached the voltage-gated l-type calcium channels open calcium rushes in and rapidly depolarize the cell to about positive 10 millivolts this is referred to as phase zero finally the l-type calcium channels closed and the voltage-gated potassium channels open which allows potassium ions to escape that’s repolarizing the cell back to negative 60 millivolt this is referred to as phase 3 after this the cycle just repeats itself also note that there is no phase one or phase two in the action potential of the pacemaker cells okay so now let’s take a look at the action potential of the cardiac muscle cells unlike pacemaker cells the cardiac muscle cells have resting membrane potential of about negative 90 millivolts due to the constant outward league of potassium to the inward rectifier channels this resting phase is referred to as phase 4 now when an action potential is triggered in a neighboring cell the voltage-gated sodium channels open and sodium rushes in causing a rapid depolarization to about positive 40 millivolts this is referred to as phase zero. These after depolarizations can occur during phase two or three or four and if they have sufficient magnitude they can trigger premature action potentials now the third mechanism of tachyarrhythmias is called reentry example of this is wolff-parkinson-white syndrome in which an extra or so-called accessory pathway exists between the upper and lower chambers of the heart so normally the electrical signal travels from the SA node to AV node to bundle branches and once it reaches the Purkinje fibers it stops and waits for another signal from the SA node now when the accessory pathway appears the signal travels through this pathway from ventricles back to atria causing them to contract before SA node fires again. This creates this abnormal loop of electrical activation circulating through a region of hard tissue causing tachyarrhythmia another example of reentry is a cha ventricular nodal reentry tachycardia a V and RT for short so typically there are two anatomic pathways for carrying signal through the AV node first pathway is called the fast pathway because it allows fast conduction however it has a longer e factory period meaning it recovers slowly on the other side this second pathway is called the slow pathway because it only allows slow conduction and because of that it has short refractory period meaning it recovers fast so now the signal comes down from the SA node and then it’s slit and travels fast through the fast pathway and slow through the slow pathway so the fast pathway signal reaches the common pathway on the other end well before the slow pathway signal gets there from there the fast pathway signal spreads to the ventricles as well as up the slow pathway where it hits the slow signal causing it to terminate. Now if a premature bead occurs at the time when the fast pathway signal is still in the refractory period the signal will travel down the slow pathway as the slow signal approaches the common pathway fast pathway comes out of refractory period so now the slow signal spreads to the ventricles and it also travels up the fast pathway but let’s not forget that the slow pathway has a short refractory period so by the time the signal rich it reaches the top the slow pathway is ready to conduct another signal so what ultimately happens here is that this signal continues to circle around sending fast impulses which result in tachycardia now let’s move on to discussing the actual anti-arrhythmic drugs so most commonly used classification of antiarrhythmics is the Vaughan Williams classification which groups most antiarrhythmics into four classes based on their dominant mechanism of action now let’s discuss each of these classes so first we have class one drugs which work mainly by blocking sodium channels in the open or inactivated state inhibition of sodium channels decreases the rate of rise of phase zero depolarization and slows conduction velocity. class one drugs are subdivided into three subclasses according to their effect on the cardiac action potential first we have class 1a drugs which moderately depress the phase zero depolarization by blocking fast sodium channels they also pre-law prolonged repolarization by blocking some potassium channels so what we’ll see what class 1-8 agents is prolonged action potential and prolonged effective refractory period the ancients in this class include procainamide quinidine and die so pyramide these agents are used in the treatment of a wide variety of arrhythmias such as ventricular tachycardias and recurrent atrial fibrillation adverse effects include blurred vision headache and tinnitus which may occur with large doses of quinidine and some anticholinergic effects which may occur with the use of dice of pyramid secondly we have class 1b drugs which have relatively weak effect on the phase zero depolarization due to minimal blockage of fast sodium channels however these agents shorten repolarization by blocking sodium channels that activate during late phase two of the action potential so what we’ll see what class 1b agents is short and duration of action potential and short an effective refractory period the agents in this class include lidocaine and maxilla Dean which are mainly used in the treatment of ventricular arrhythmias when it comes to adverse effects lidocaine can cause CNS toxicity including seizures. while maxilla teen can cause nausea and vomiting now the third and the last subtype that we have if Clause 1c drugs which are powerful fat sodium channel blockers which depress the phase zero depolarization markedly they also inhibit the hiss Purkinje conduction system with a limited effect on repolarization and refractory period the agents in this class include flecainide and propafenone which are mainly used in the treatment of refractory ventricular arrhythmias when it comes to the rest of X the most common ones include dizziness blurred vision and nausea also something that I haven’t mentioned yet is that one of the risk associated with the class one agents actually all of them is that they have potential to actually cause arrhythmias themselves so when the risk versus benefit is very important before initiating therapy with these agents now let’s move on to class two anti-arrhythmic drugs so agents in this class act on the beta 1 receptors preventing the action of colonies on the heart so close to a Giunta beta-blockers beta-blockers depress sinus node automaticity and slow conduction through the AV node which results in decreased heart rate and decreased contractility examples of beta blockers commonly used for arrhythmia are propeller or metoprolol atenolol and esmolol now esmolol unlike the other beta blockers is somewhat special in that it’s given intravenously in an emergency acute arrhythmias and the reason for that is that it has fast onset of action and very short half-life which allows it to be titrated rapidly when necessary. so the bottom line is that beta blockers are a good choice for treatment of arrhythmias provoked by increased sympathetic activity and if you want to learn more about them check out my other videos about adrenergic receptors and beta blockers now let’s move on to class three antiarrhythmic drugs so class three agents work mainly by blocking the potassium channels that are responsible for the Phase three repolarization this leads to increase in duration of action potential and increase in effective refractory period the agents in this class include amiodarone drone a drone solo law to Ferro light and a butyl light there are mainly used in treatment of supraventricular and ventricular tacky arrhythmias as was each of the brie asian and flatter the most widely used drug in this class is amiodarone which is very effective for the treatment of these upper mention arrhythmias and the other one has multiple actions and besides blocking potassium channels i’m urine also blocks sodium channels calcium channels and even some alpha and beta receptors unfortunately. A mutant is also associated with many adverse effects such as pulmonary fibrosis blue grey skin discoloration neuropathy hepatotoxicity core micro deposits and because it contains iodine I’m urine also can cause thyroid dysfunction leading to hypo or hyperthyroidism lastly due to its long half-life a urine can linger in many tissues for months after discontinuation of therapy now on the other hand we have drawn a drone which is derivative of a milligram it’s less lipophilic and has shorter half-life it also doesn’t contain iodine so in general it has better side effect profile unfortunately in many cases drone a drone doesn’t seem to be as effective as a mural now solo law is a unique drug in this class because it not only has potassium channel blocking activity but also beta receptor blocking activity lastly the federal ID and a butyl ID are the most selective potassium channel blockers in this class however they’re also most likely to cause arrhythmias themselves and therefore are typically initiated in the inpatient setting only now let’s move on to class for anti rhythmic drugs so class four agents work by blocking both of sensitive calcium channels during depolarization particularly in the SA and AV nodes which results in slower conduction in these tissues and reduce contractility of the heart. 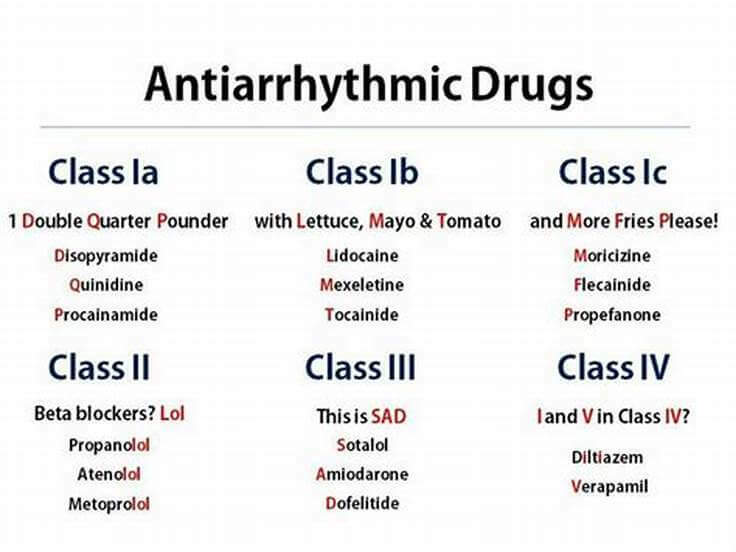 The agents in this class include verapamil and Delta ISM which are the non dihydropyridine calcium channel blockers unlike the Hydra Purdy’s which act primarily in the periphery causing vasodilation nonde hai dropper Dean’s are much more selected for the myocardium and therefore they show antiarrhythmic actions retinol and Delta Z are most commonly used in treatment of supraventricular tachycardia and h-hold fibrillation and now before we end this lecture I wanted to briefly discuss some other antiarrhythmic agents that do not quite fit into any of the classes that we covered thus far and these are the Jackson adenosine and magnesium sulfate so let’s talk about the jocks infers and in order to understand how it works let’s picture a cardiac cell under resting conditions sodium slowly leaks into the cell and potassium leaks out however during an action potential additional sodium enters in along with calcium and additional potassium leaves the cell so at some point we have this imbalance that has to be restored and this restoration is accomplished by pumps such as sodium potassium ATPase which transports sodium ions to the outside of the cell and potassium to the inside of the cell and we also have sodium calcium exchanger which removes calcium from the cell in exchange for sodium and as a side note here keep in mind that sodium calcium exchanger can carry sodium and calcium in both directions. So now what happens when the Jackson comes around is that it inhibits sodium potassium pump by binding to the potassium binding site this results in the increase in intracellular sodium which then in turn causes the sodium calcium exchanger to pump sodium out and bring more calcium in now this increase in intracellular calcium leads to enhanced myocardial contractility the Jackson also stimulates parasympathetic system which increases activity of the vagus nerve this results in the slowing of sinus node discharge rate and decrease conduction through the AV node these actions make digoxin particularly useful for patients with both heart failure and atrial fibrillation now let’s talk about the second agent which is adenosine unlike all the other agents adenosine is a naturally occurring nucleoside it works by stimulating a one type adenosine receptors on the atrium as well as on the SA node and AV node which results in decreased automaticity decreased conduction velocity and prolonged refractory period due to its very short duration of action adenosine has to be administrated by IV its main indication is an acute supraventricular tachycardia one of them biggest benefits of adenosine is that it’s relatively non-toxic with the most common side effects being chest pain flushing and hypotension now finally let’s talk about our third agent which is magnesium sulfate magnesium sulfate plays an important role in transport of sodium potassium and calcium across the cell membranes unfortunately its precise mechanism of action for treating originals is largely unknown however what we know is that magnesium sulfate administered intravenously is very effective for treatment of Taurus at the point and the jocks and induce arrhythmias and with that I wanted to thank you for watching I hope you enjoyed this lecture and as always stay tuned for more. Copyright © 2019, 9japharma's club.